International Monetary Fund chief Christine Lagarde yesterday met Pakistani Prime Minister Imran Khan and assured him that IMF stands ready to support his country. The meeting took place on the sidelines of the World Government Summit in Dubai, hosted by the United Arab Emirates, both IMF and prime minister Imran Khan’s office said. 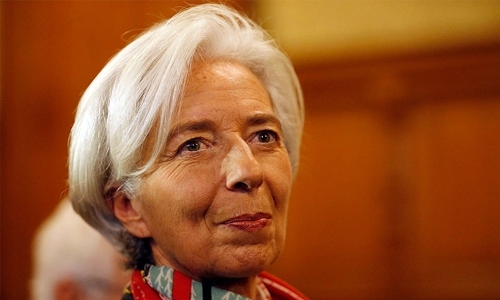 “I reiterated that the IMF stands ready to support Pakistan,” Lagarde said in a statement following meeting Khan. A team from the International Monetary Fund visited Pakistan in November to discuss a possible bailout with officials, though the talks ended without agreement, but since then the government official said talks were still ongoing on a possible bailout. Pakistan -- which has gone to the IMF repeatedly since the late 1980s -- is facing a balance of payments crisis. Pakistan -- a regular borrower from the IMF since the 1980s -- last received an IMF bailout in 2013 to the tune of $6.6 billion. Forecasts by the IMF and World Bank suggest the Pakistani economy is likely to grow between 4.0 and 4.5 per cent for the fiscal year ending June 2019, compared to 5.8pc growth in the last fiscal year.